Rather than hurrying through either the classroom or driving portion of our program, we believe shorter class times provide a more lasting learning experience. Classroom time is divided into four (4) 2-hour classes offered different times throughout the month. Click on a link to register for class 1. 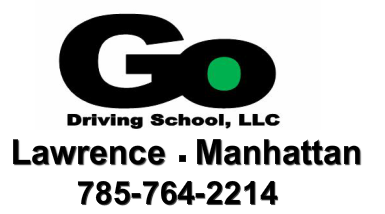 Registration for class 1 will include a form to provide the information needed for the State of Kansas to issue a Driver Education Permit (DE99) and choices for classes 2, 3, and 4. Classes 1, 2, 3, and 4 must be taken in order. Behind the wheel time is scheduled after the first class and the DE99 has been issued by the State. ​The cost for a driver education class is $310. It includes, as required by the State of Kansas, a minimum of eight (8) hours of classroom and six (6) hours of behind the wheel instruction. If the scheduled classes are not at a convenient time you may request special class times. The cost for a requested schedule class is $460 (but if five (5) or more students register for the class it is regular price). ﻿Please note: INTERNATIONAL STUDENTS with B (tourist) visas cannot take driver education. Students with other visas can take driver education but must apply for a driver’s license more than 60 days before their visas expire. Also note: if you fail the Kansas DMV written or driving exam 4 times you must wait 6 months before taking a driver education class. If none of the classroom times on the calendar work with your schedule, you can request ​a Special Schedule Class in Lawrence. Click on the link below to send a request.